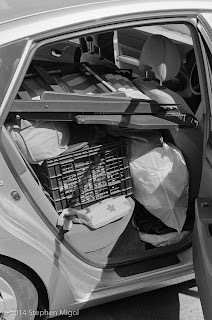 In the past, I packed the Prius pretty heavily as seen above. This time is no different. I've had the good fortune to get a roof rack and cargo box for the sedan at a good price. This has done well to hold bulky items like sleeping bags, the tent, and cots. New this year are the cots and sleeping rolls. Also new this year is a passenger - my niece is going along for the trip! This means extra bedding, extra food, and an extra scope! Today was an exercise in putting stuff in order for packing, noting to leave the tent and early-access materials in the rooftop cargo bin. Clothing was sorted by the first day and then rest of week supplies. Food is still not packed as I've left a large hole for the cooler and the last of the packages. I've changed the way I packed to be a little more efficient as well. I'm not using the skin-scraping black milk crates. Instead, I'm using a couple of Plano Molding 1619 trunks. These are strong enough to sit on and remove the old single-purpose green rubbermaid container I'd used in the past. Also, they're slightly larger and can hold a bit more gear, including bulky items like tarps and the aluminet. There are tradeoffs that aren't positive because of the space change. I've had to reduce my goals for the session. No chairs this time. It was a hard decision to not bring the comfy chairs seen in the above picture. There's just not enough room to pack them. I'm no longer going to use the 400 mm lenses on the Pentax 67 camera. There's not enough room to carry them. Instead, I'm planning to use a fisheye, 105mm, 167mm, and 200mm. This will suffice for most widefield work that I'm exploring. Also, I'm not going to try the side-by-side setup for the dual camera system. 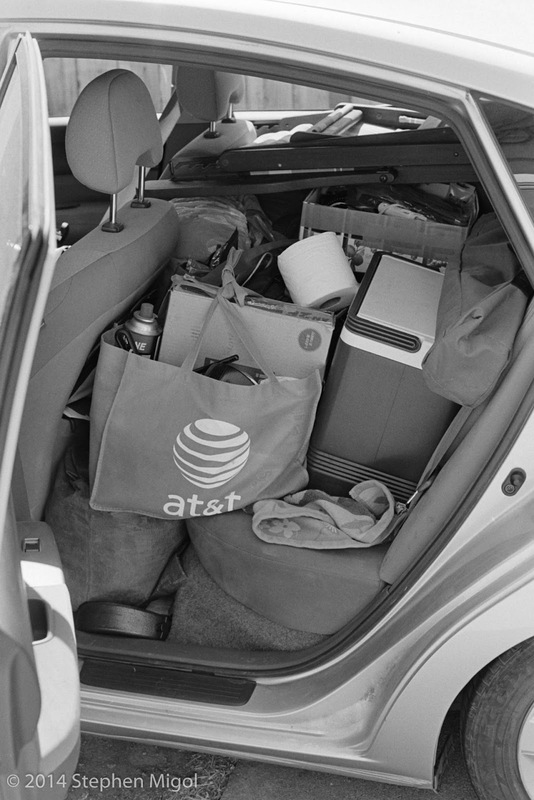 Again, there's just not enough space in the car. I only plan to bring two medium format cameras: one for astro work and one for scenic work. I do plan to bring a 35 mm camera, loaded with either black and white or color film. I still need to roll up some more film, too! Overall target list will not change. Still plan the same shots. I will bring the small Stellarvue 70ED scope with the herschel wedge and a few eyepieces. This, along with binoculars, will go a long way towards having fun looking at the stars with Rebecca. I'll take pictures in the morning and attach to this post. Next stop, Lassen! Then on to GSSP!